Since Chip-Racing is highly specialized int the Toyota GT86 Tuning and Subaru BRZ Tuning we keep developing our stages and push the limits even further! With our latest upgrade we set yet another benchmark for GT86 tuning in switzerland! Our todays GT86 runs our CR280 Turbokit installed, completed with our CR320 upgrade which takes care of the engines temperatures but also helps running that slightly higher boost with its better boost solenoid and breather system! Also the injectors have been replaced to feed the engine with enough fuel! Airbox, overpipe and catalyst converter are still factory and are completely untouched! With our Chip-Racing Flexfuel kit we can run E85 Bioethanol and get even more power out of the FA20 turbo! 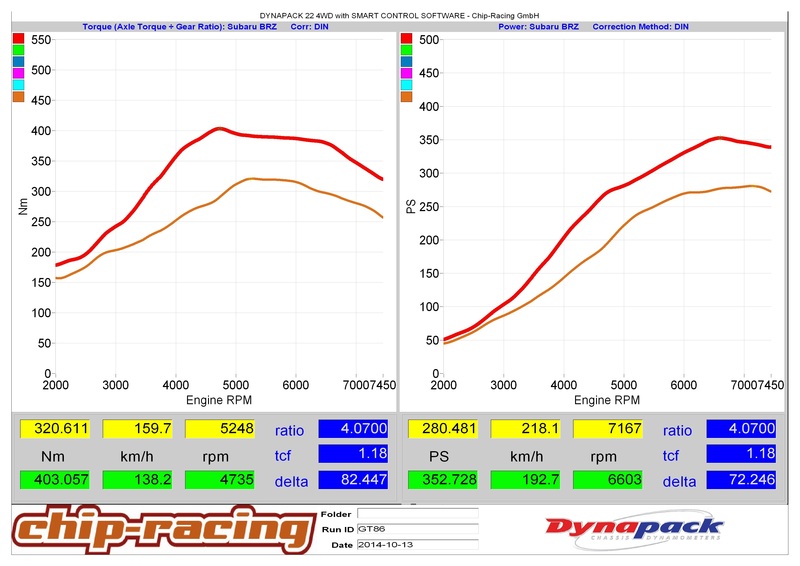 The Result is astonishing, more than 70hp just with changing the fuel! Once again, E85 shows how far superior it is compared to ordinary 98RON fuel. With our Flexfuel Kit, E85 can now be used on a daily basis without none of its drawbacks like bad cold start etc! With this setup we’re hitting the limit of the factory airbox, catalyst and overpipe. Also we had to limit the torque to slightly above 400Nm to make sure the gearbox will hold up! In a future test we will replace those parts with some aftermarket goods and hit the 400hp mark! Hello, I am a garage and I have questions. We have a Toyota GT86 and we want to upgrade it with your Turbokit. Our Toyota already has a full exhaust ( Agency Power Header and full Milltek exhaust, overpipe, secondary catalyst by pass, non-resonated center and silencer ), APR kit, KW Clubsport, cusco catchtank and a Greddy airbox. We would like to know if eventually you do garage discounts, if one is obliged to give you the vehicle and work for the CH aprovation and if you speak French. We would like a quote for the turbo kit CR320 , Flexfuel E85 , oilcooler , bigger catchtank and especially your advice to get the best of the vehicle. We sent you a quote per mail.